This article is about Native American/First Nations gatherings. For other uses, see Pow wow (disambiguation). A powwow (also pow wow or pow-wow) is a social gathering held by many different Native American communities. A modern pow wow is a specific type of event for Native American people to meet and dance, sing, socialize, and honor their cultures. Pow wows may be private or public. There is generally a dancing competition, with many different types of traditional dances, music and regalia, often with significant prize money awarded. Pow wows vary in length from a one-day event, to major pow wows called for a special occasion which can be up to one week long. In popular culture, such as older Western movies, the term has also been used to describe any gathering of Native Americans, or to refer to any type of meeting, such as among military personnel. This usage is sometimes discouraged because it can be seen as minimizing the cultural and ceremonial importance of pow wows. The word “pow wow” is derived from the Narragansett word powwaw, meaning "spiritual leader". The term itself has different variants including Powaw, Pawaw, Powah and Pawau. A number of different tribes claim to have held the “first” pow wow. Initially, public dances that most resemble what we now know as pow wows were most common in the Great Plains region of the United States during the late nineteenth and early twentieth centuries, a time when the United States government fragmented many Native communities in the hopes of acquiring land for economic exploitation. In 1923, Charles Burke, Commissioner of Indian Affairs in the United States, passed legislation modeled on Circular 1665, which he published in 1921, that limited the times of the year in which Native Americans could practice traditional dance, which he deemed as directly threatening the Christian religion. However, many Native communities continued to gather together in secret to practice their cultures’ dance and music, in defiance of this, and other, legislation. By the mid-nineteenth century, pow wows were also being held in the Great Lakes region. Planning for a pow wow generally begins months, perhaps even a year, in advance of the event by a group of people usually referred to as a pow wow committee. Pow wows may be sponsored by a tribal organization, by an American Native community within an urban area, a Native American Studies program or American Native club on a college or university campus, tribe, or any other organization that can provide startup funds, insurance, and volunteer workers. A pow wow committee consists of a number of individuals who do all the planning prior to the event. If a pow wow has a sponsor, such as a tribe, college, or organization, many or all members of the committee may come from that group. The committee is responsible to recruit and hire the head staff, publicize the pow wow, secure a location, and recruit vendors who pay for the right to set up and sell food or merchandise at the pow wow. The head staff of a pow wow are the people who run the event on the day or days it actually occurs. They are generally hired by the pow wow committee several months in advance, as the quality of the head staff can affect attendance. To be chosen as part of the head staff is an honor, showing respect for the person's skills or dedication. The arena director is the person in charge during the pow wow. Sometimes the arena director is referred to as the whip man, sometimes the whip man is the arena director's assistant, and many pow wows don't have a whip man. The arena director makes sure dancers are dancing during the pow wow and that the drum groups know what type of song to sing. If there are contests the arena director is ultimately responsible for providing judges, though they often have another assistant who is the head judge. The arena director is also responsible for organizing any ceremonies that may be required during the pow wow, such as when an eagle feather is dropped, and others as required. One of the main duties of the arena director is to ensure that the dance arena is treated with the proper respect from visitors to the pow wow. The master of ceremonies, or MC, is the voice of the pow wow. It is his job to keep the singers, dancers, and public informed as to what is happening. The MC sets the schedule of events, and maintains the drum rotation, or order of when each drum group gets to sing. The MC is also responsible for filling any dead air time that may occur during the pow wow, often with jokes. The MC often runs any raffles or other contests that may happen during the pow wow. 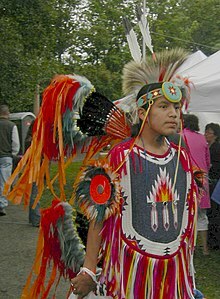 The head dancers consist of the Head Man Dancer and the Head Woman Dancer, and often Head Teen Dancers, Head Little Boy and Girl Dancers, Head Golden Age Dancers, and a Head Gourd Dancer if the pow wow has a Gourd Dance. The head dancers lead the other dancers in the grand entry or parade of dancers that opens a pow wow. In many cases, the head dancers are also responsible for leading the dancers during songs, and often dancers will not enter the arena unless the head dancers are already out dancing. The singers while singing. Host drums are responsible for singing the songs at the beginning and end of a pow wow session, generally a starting song, the grand entry song, a flag song, and a veterans or victory song to start the pow-wow, and a flag song, retreat song and closing song to end the pow wow. Additionally, if a pow-wow has gourd dancing, the Southern Host Drum is often the drum that sings all the gourd songs, though another drum can perform them. The host drums are often called upon to sing special songs during the pow-wow. Famous host drums include Black Lodge Singers, Cozad Singers, and Yellowhammer. A pow wow is often set up as a series of large circles. The center circle is the dance arena, outside of which is a larger circle consisting of the MC's table, drum groups, and sitting areas for dancers and their families. Beyond these two circles for participants is an area for spectators, while outside of all are designated areas with vendor's booths, where one can buy food (including frybread and Indian tacos), music, jewelry, souvenirs, arts and crafts, beadwork, leather, and regalia supplies. 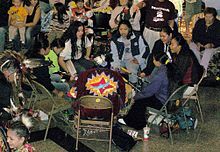 At outdoor pow wows, this circle is often covered by either a committee-built arbor or tent, or each group, particularly the MC and the drums, will provide their own. While most of the time, a tent provides shelter from the sun, rain can also plague outdoor events. It is particularly important to protect the drums used by the drum groups, as they are sensitive to temperature changes and, if it rains, they cannot get wet. Most vendors provide their own tents or shelters at an outdoor pow wow. A pow-wow session begins with the Grand Entry and, in most cases, a prayer. The Eagle Staff leads the Grand Entry, followed by flags, then the dancers, while one of the host drums sings an opening song. This event is sacred in nature; some pow wows do not allow filming or photography during this time, though others allow it. If military veterans or active duty soldiers are present, they often carry the flags and eagle staffs. They are followed by the head dancers, then the remaining dancers usually enter the arena in a specific order: Men's Traditional, Men's Grass Dance, Men's Fancy, Women's Traditional, Women's Jingle, and Women's Fancy. Teens and small children then follow in the same order. Following the Grand Entry, the MC will invite a respected member of the community to give an invocation. 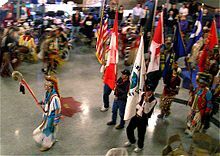 The host drum that did not sing the Grand Entry song will then sing a Flag Song, followed by a Victory or Veterans' Song, during which the flags and staffs are posted at the MC's table. The different styles and types of dances at a pow wow are descended from the traditions of the Great Plains nations of Canada and the United States. Besides those for the opening and closing of a pow wow session, the most common is the intertribal, where a Drum will sing a song and anyone who wants to can come and dance. 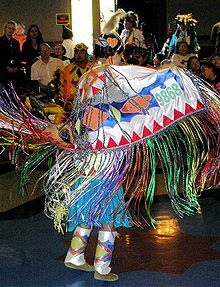 Similar dances are the round dance; crow hop when performed by a northern drum or a horse stealing song by a southern drum; there is also "double beat", "sneakup" and, for Women's Traditional and Jingle, "sidestep". Each of these songs have a different step to be used during them, but are open for dancers of any style. 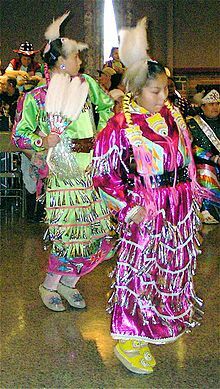 Fancy Dance or Fancy Feather Dance (Northern and Southern styles): A dance featuring vivid regalia with dramatic movement, including spins and leaps. Fancy dancers are distinguished by their bright colored regalia which consists of two large bustle worn on the upper and lower back. .
Northern Traditional (simply "Men's Traditional" in the North): A dance featuring traditional regalia, single or no bustle, and movements based on the story telling traditions of when the powwow was first danced as a ceremony among the warrior societies of the Ponca and the Omaha. Straight dance (or Southern traditional): Straight dancers usually are more neat and with more homemade features such as chokers, breastplates, etc. Their dances are like Northern, They take one foot and step on the ball of their foot and then they tap it once on the ground. Then they tap it once again but this time they put their heel a few millimeters above the ground and repeat the process with the other foot. They do this in a walking motion. it is very hard especially if you have to follow the beat of fast drums. If they catch themselves off beat they will tap their foot three times instead of two to get back with the drums' rhythm. 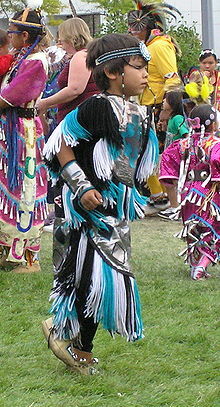 Grass Dance: A dance featuring regalia with long, flowing fringe and designs reminiscent of grass blowing in the wind. Dance movements are more elaborate than the traditional dancers, but less flashy than the fancy dancers. Eastern War Dance: A dance from the East Coast that is a storytelling dance, Men wear no bustle however do carry a fan and dance stick. This is also called the "Eastern Strait Dance". Traditional (seen at Northern pow wows): A dance featuring traditional regalia of cloth or leather, and dancers who perform, with precise, highly controlled movement. Buckskin and Cloth: A traditional dance from the South. The name refers to the type of material of which the dress is made. 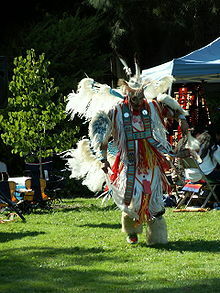 The regalia is similar to the Northern traditional dance. However, in the South, buckskin and cloth dancers are judged in two separate categories. The dance steps are the same for both regalia categories. Fancy Shawl: A dance featuring women wearing brilliant colors, a long, usually fringed and decorated, shawl, performing rapid spins and elaborate dance steps. 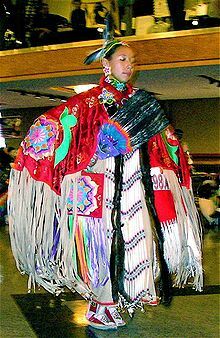 Jingle Dress (healing dance):The jingle dress includes a skirt with hundreds of small tin cones that make noise as the dancer moves with light footwork danced close to ground. At pow wows where there is a large Southern Plains community in the area, the Gourd Dance is often included before the start of the pow wow sessions. The gourd dance originated with the Kiowa tribe, whence it spread, and is a society dance for veterans and their families. Unlike other dances, the gourd dance is normally performed with the drum in the center of the dance arena, not on the side. Though there are many genres unique to different tribes pow wow music is characterized by pan or intertribalism with the Plains cultures, the originators of the modern pow wow, predominating. For information on dancing, see Dances. "Good drums get the dancers out there, good songs get them to dance well. Without drum groups there is no music. No music, no dance, no powwow." There may be many drums at a pow wow, especially weekend or week long ones, but each pow wow features a host drum which is accorded great respect. The members of drum groups are often family, extended family, or friends. Groups are then often named for families, geographic locations, tribal societies, or more colorful names. Many groups display their names on jackets, caps, vehicles, and chairs. Traditionally only men would drum and women would sit behind the men singing high harmonies. Beginning in the mid-1970s, women began drumming with men and seconding, or singing, an octave higher, the song. Today, there are mixed-gender and all-female drum groups. The supplies a drum group carries include the drum, rawhide headed, a cloth bag for padded drum sticks, the drum stand, folding chairs for sitting, and, in some cases, a public address system. 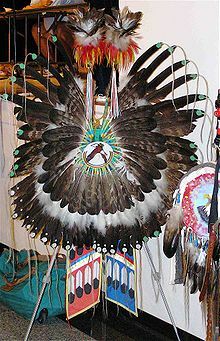 The drum head, stand, microphone stands, and PA box are often decorated with paintings or eagle feathers, fur, flags, and strips of colored cloth. Readily noticeable in performances are the "hard beats" used to indicate sections of the song. The "traditional method" consists of a pronounced strike by all singers every other beat. These may appear in the first or second line of a song, the end of a section, before the repetition of a song. A cluster of three hard beats (on consecutive beats) may be used at the end of a series of hard beats, while a few beats in the first line of a song indicate performer enthusiasm. In the "Hot Five" method five beats are used, with the first hard beat four beats before the second, after which the beats alternate. To understand drum protocol, a drum may be thought of as a person or being and is to be regarded and respected as such. Drum etiquette is highly important. There are regional variations. The drum is the central symbol of Oklahoma pow wows and is located in the center of the dance floor and pow wow (which are themselves shaped in concentric circles). Southern drums are suspended by four posts, one for each direction. Northern drums are set up on the outside of the dance area, with the host drum in the best position. Drummer-singers are expected to remain at their drum and ready to sing at any moment's notice; a dancer might approach the drum and whistle, fan or gesture his staff over a drum to indicate his request for a song even if it is not that drum group's turn to sing. In some regions it is considered disrespectful to leave a drum completely unattended. Some drum groups do not allow females to sit down at their drum but welcome them to stand behind the drummers and sing backup harmonies; the reasons for this point vaguely to a variety of tribal stories that attempt to tell the history of drumming as each group understands it. The drum is offered gifts of tobacco during giveaways and musicians acknowledge this by standing. 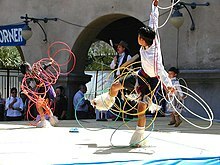 Hoop Dancers are featured at some Pow Wows. The hoop has no beginning or end; it represents the continuity of the spirits of all living things. While the drum is central to pow wows, "the drum only helps them keep beat. Dancers key on the melody of the song. Rhythms, tones, pitch all help create their 'moves'." (p. 85) Note that Bill Runs Above did not mention the lyrics of the songs, and while they are no doubt important, most lyrics of most songs employ vocables, syllable sounds such as "ya", "hey", and "loi" (p. 86). This is particularly evident in intertribal songs, such as the AIM Song, which cannot be biased towards a certain language. The song structure consists of four pushups, singing the chorus and verse through four times. In each chorus the melody is introduced or led off by the lead singer whose is then seconded by another singer who begins to vary the melody before the end of the leader's first line. They are then joined by the entire chorus for the rest of the pushup. Three down strokes or hard beats mark the end of the chorus and beginning of the verse, and during these dancers will alter their dancing such as by hopping low like fancy dancers. An increase in tempo and volume on the last five beats marks the end of the final verse. The dancing stops on the final beat and then a tail, or coda, finishes the song with a shortened chorus. Sometimes a drum group will sing the song more than four times, particularly when the song feels good and the singers seize the moment for an extra pushup or two (or more), or when a dancer blows a whistle or passes his staff or fan over the drum to signal that the song is to be continued four extra pushups while he prays. Singing differs by region in that a high falsetto is used in the north while in the south a lower range is used. "To the unfamiliar listener, Indian singing sounds exotic, different, and difficult to comprehend," and the contrast in the quality or timbre of voice used in traditional Indian and European musics may have much to do with that difficulty. However, "to the trained ear, melodies flow, ascend and descend" while dancers react to changes in the structure of the melody and the song. Boye Ladd says, "If you give me a stink song, I'll dance stink. If you give me good music, I'll give you a great show," implying that one can appreciate the music through the dancing, which is readily appreciated by everyone. But others say that today's contemporary contest dancers are expected to dance their best no matter how well or poor the drum group is that is singing for their contest. Generally, Native American singing follows a pentatonic scale (as if playing only the black keys on a piano) and while, to the outsider, it may sound like we're just pounding a drum and going "Heya-heya-heya-heya" sometimes there are actual words in Cree, Pikuni, Lushuutsid, Niimipuu, Lakhota, Sahpatin, Salish, Ojibwemowin or many other Native languages. ^ O'Brien, Frank Waabu. "Chapter 10: Spirit Names and Religious Vocabulary". pp. entry # 12. Retrieved 20 July 2014. ^ Ostler, Rosemarie (2018). Splendiferous Speech: How Early Americans Pioneered Their Own Brand of English. Chicago Review Press. ISBN 9780912777078. Retrieved 13 September 2018. ^ a b c Browner, Tara (2002). Heartbeat of the People: Music and Dance of the Northern Pow-wow. Urbana and Chicago: University of Illinois Press. pp. Chapter 2. ^ Ellis, Clyde (2003). A Dancing People: Powwow Culture on the Southern Plains. Lawrence, Kansas: University Press of Kansas. pp. 14–15. ^ "Powwow-Power.Com's Powwow Etiquette". Powwow-power.com. Retrieved 2013-09-10. ^ Volante, Enric. "Respectful Ways go a Long Way on Arizona Indian Land". Navajo Central. Navajo Central. Retrieved 20 November 2016. ^ Roberts, Chris (1992). Powwow Country. ISBN 1-56037-025-4. ^ *Roberts, Chris (1992). Powwow Country, p.85-89. ISBN 1-56037-025-4. ^ Roberts, Chris (1992). Powwow Country, p.86 and 89. ISBN 1-56037-025-4. ^ Hatton, O. Thomas (1974). "Performance Practices of Northern Plains Pow-Wow Singing Groups", Anuario Interamericano de Investigacion Musical, Vol. 10, pp. 129. ^ Hatton, O. Thomas (1974). "Performance Practices of Northern Plains Pow-Wow Singing Groups", p.85-86, Anuario Interamericano de Investigacion Musical, Vol. 10, pp. 123-137. ^ *Roberts, Chris (1992). Powwow Country, p.85-86. ISBN 1-56037-025-4. ^ Nettl, Bruno (1989). Blackfoot Musical Thought: Comparative Perspectives. Ohio: The Kent State University Press. ISBN 0-87338-370-2. ^ a b *Roberts, Chris (1992). Powwow Country, p.86. ISBN 1-56037-025-4. Hatton, O. Thomas (1974). "Performance Practices of Northern Plains Pow-Wow Singing Groups", Anuario Interamericano de Investigacion Musical, Vol. 10, pp. 123–137. Kyi-Yo (2007). Kyi-Yo Celebration. Kyi-Yo student organization, Native American studies, University of Montana. Nettl, Bruno (1989). Blackfoot Musical Thought: Comparative Perspectives. Ohio: The Kent State University Press. ISBN 0-87338-370-2. Roberts, Chris (1992). Powwow Country. ISBN 1-56037-025-4. Wikimedia Commons has media related to Pow wows.